High-class Mexican street food in a vibrant setting. : Richard Sandoval’s El Centro D.F. buzzes on all its dining levels, with crowds and chattering heralding good times and food. Where to start with a menu that reads like a guidebook to Mexican street fare? First, order the guacamole made tableside and served with hot, crispy chips. Accompany this and the entire meal with one of the classic tequilas or mezcals (more than 200 different labels on hand) straight or mixed into a cocktail. Musts include the pork carnitas either as an appetizer or entrée, followed by al pastor tacos (three to an order) and main course platters of chiles rellenos or carne asada with sautéed chiles poblanos. Tres leches cake for dessert is a real treat. If you know Mexican food, you may hesitate in claiming this as authentic, but considering the local competition, El Centro makes a good impression with abundant portions, a variety of tequila-based cocktails, and its cheerful ambience. 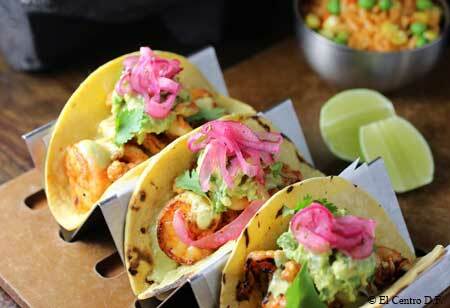 The lunch menu presents such winners as the al pastor and the pork carnitas tacos, along with shrimp ceviche. Also located at 1218 Wisconsin Ave. NW, 202-333-4100.